Previous post: [KoKoLoReS]: Shirts for Lazy Sunday! It’s getting cold, wet and dreary outside, so that calls for bold colours! Unfortunately I can’t wear yellow and orange in RL because I look ill in them – but my avi can! Showing you here the new face from DeeTaleZ – Hanna – it’s a lovely, intriguing face and I seldom can resist those! 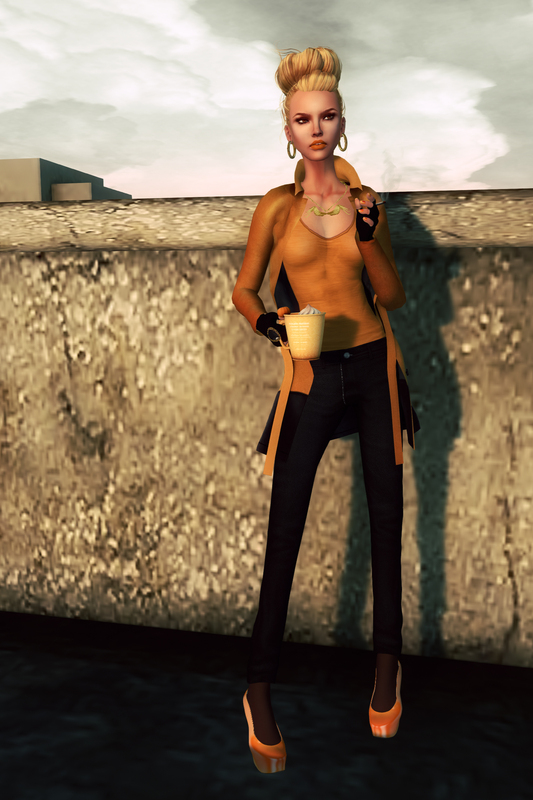 My coat is from Pink Outfitters available at FaMESHed, my trousers are from Entente. The fingerless gloves from A:S:S are another example for the wonderful things that can be done using the new tattoo layers for the Slink hands – if you haven’t updated yours yet, you should definitely do so! My coffee is from *Art Dummy! and can be bought at Atelier Kreslo – you should tp over and get one, it’s sooo tasty!